A father and son pose for their portrait at the Tornquist gallery in Duluth, Minnesota. At least it is my hypotheses that they are father and son based on their similar facial features. It appears that the men are wearing work clothes. Hopefully the son learned a lot about life from his father. However, I hope the son did not inherit his father’s fashion sense. Dad’s striped pants and plaid shirt clash big-time. Someone should call the fashion police. Dad’s poor fashion judgement should result in a felony. The photographer of this cabinet card portrait is Axel M. Turnquist. Mr Turnquist got around. He was born in Sweden and trained as a photographer in Duluth. He operated photographic studios in many Minnesota towns including, Eveleth, Hibbing, Aurora, Tower, Virginia, and Duluth. His photography career spanned from the 1880’s through 1923. 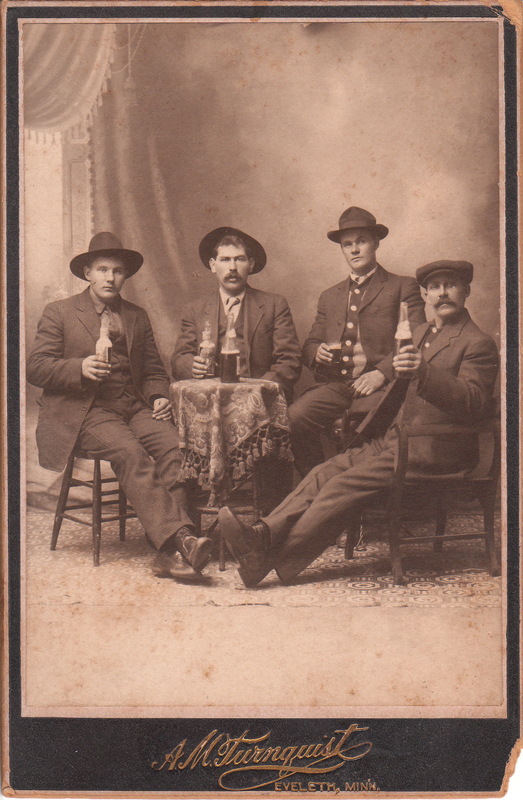 This cabinet card is in very good condition (see scans). 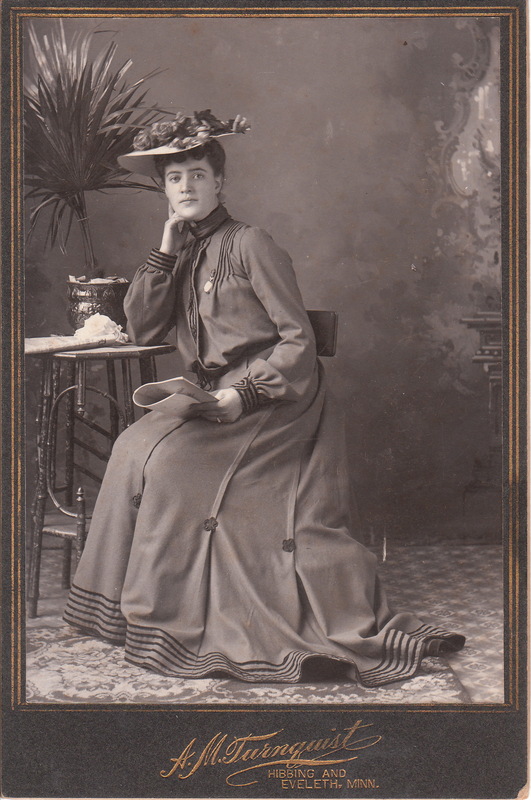 The subject of this photograph is a very pretty woman, stylishly dressed and wearing a flowered hat at the photographic studio of A. M. Turnquist, located in either Hibbing or Eveleth, Minnesota. The woman appears quite natural and relaxed as she sits at a table with a potted plant in the background. What are those papers that she is holding? Is it possibly a script for a play, a magazine, or divorce documents? The answer is lost to time. A. M. Turnquist is more specifically, Axel M. Turnquist who was born in Sweden, and trained in photography in Duluth, Minnesota. He operated photographic studios in many Minnesota towns including Tower, Virginia, Eveleth, Hibbing, and Aurora. He worked as a photographer form the 1880’s through 1923. To view other photographs by Turnquist, click on category “Photographer: Turnquist”.